Newer here to everything, appreciate any guidance. Basically, we have a customer running Box Sync. It doesn't run as a service and actually just runs as a background process under the logged in user. So I created a Group that Autojoins on a search to monitor the machines with Box Sync. Then a remote monitor watching the process. Looks like I'll create a new Autofix Alert Template and then I copied an Autofix script to repurpose. However, I don't see a way to launch a process as the current logged in user. Only as admin, system, or a specific user. 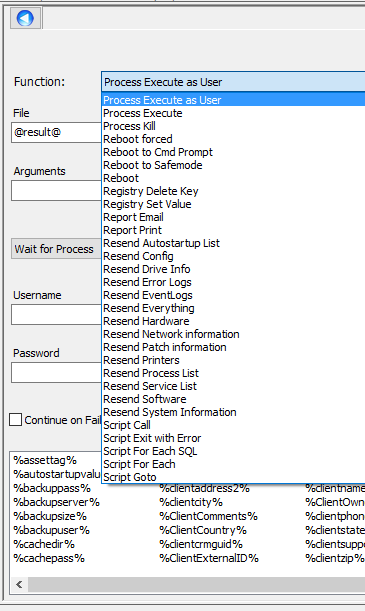 Is it not possible to relaunch the process if it quits as the current logged in user using a Automate script function? Yea the guys on slack pointed me here. Worked well. Wish you could run a script as the logged on user, but doesn't appear to be possible directly. Can run a shell command calling a downloaded script will have to do.